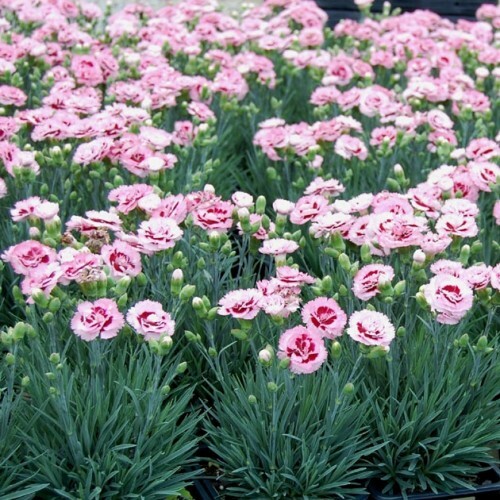 Dianthus is a fantastic container plant. It’s super easy to grow and so, so satisfying. A little dead-heading goes a long way in keeping them in continual bloom during the summer months. And did I mention the spicy scent? Yummy! What a charming plant! It flowers (with dead heading) from late spring through to late summer. The foliage is attractive and it smells simply delicious - like spicy cinnamon. It is easy to grow - either in the garden or in containers. Because its also drought and heat tolerant it does especially well on patios and decks. 'Raspberry Surprise' belongs to the award-winning Scent First series of Garden Pinks from Whetman Pink, which are noted for their spicy fragrance, compact habit and long bloom season.